There has been a lot in the media lately about fire safety. The tragedies of high-rise building fires in recent years across the country have raised our awareness of the devastation it can bring and of the fire hazards found around the home. This month we take a look at the things you can do to minimise the risk and keep your home safe. Have your boiler serviced regularly. Always use a Gas Safe registered engineer and call them in if you suspect something isn’t right or your central heating isn’t working properly. If you have portable heaters keep them away from anything that could be flammable (the minimum distance should be three feet/one metre) and turn them off when you go to bed or leave the house. Don’t leave candles unattended. Clean your chimney. Do this once a year during the summer when you are not using your fireplace. Make sure logs and firewood are stored safely and away from anything that could ignite them. Check your kitchen stove. If it is gas, make sure there are no leaks; if it is electric ensure all connections are safe. When cooking keep flammable things such as tea towels and loose clothing away from the cooker and make sure all appliances are switched off when you have finished. Keep a fire blanket within easy reach and store matches and lighters safely out of the reach of young children. 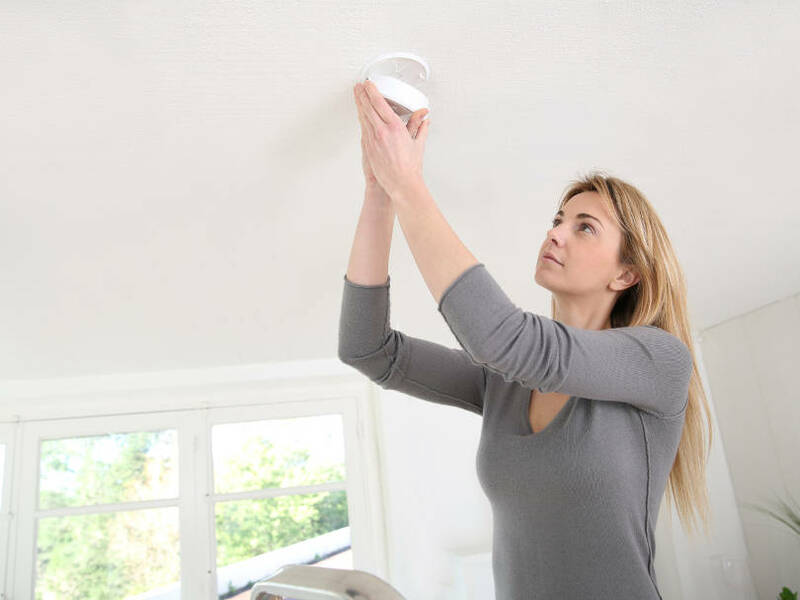 Install a smoke alarm if you don’t already have one and check it monthly to make sure the batteries are full and that it is in good working order. Check your electrics. Don’t overload your plugs and switch things off if you are away for the night or on holiday. Look for any loose wires and inspect your plugs – are there any dark spots around any of them or do they feel hot? It is worth getting an electrician in once in a while for a professional check of all your electrics to make sure they are safe. Remove lint from your dryer each and every time you use it. A build-up of lint can clog the filters making it work harder to and less efficiently and forcing the lint into heating coils as it moves around. Don’t run the dryer when you are asleep or away from home. Clear our rubbish from outdoor spaces and communal areas. A build-up of rubbish or dead vegetation could lead to a fire or could impede your escape if you need to get out quickly. If you are a smoker only use ashtrays that can’t burn; ceramic, glass, or metal ashtrays are best. Never, ever smoke in bed as you could fall asleep and always make sure your cigarette is well stubbed out and not still alight. Have an escape plan ready and make sure everyone in the house knows what it is. For more advice on staying safe from fire at home or if you are considering installing a fire alarm, give our DNA Security team a call. You can reach us on 01424 718 844 for an initial chat or to make an appointment.